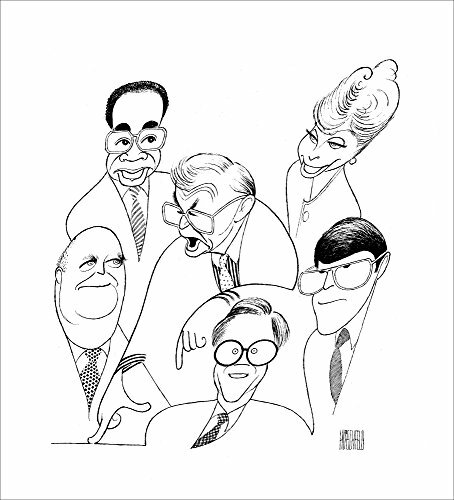 The McLaughlin Group is hand signed by Al Hirschfeld. The Edition Size is 110 numbered impressions plus artist’s proofs. Paper size: 27″ (h) x 21″ (w). This piece depicts: Eleanor Clift, Dr. John McLaughlin, Fred Barnes, Morton Kondracke, Clarence Page, and Jack Germond. The McLaughlin Group comes with a Certificate of Authenticity from Al Hirschfeld’s representative, the Margo Feiden Galleries Ltd. Art is © Al Hirschfeld. All of Al Hirschfeld’s art may be reproduced by arrangement with the Margo Feiden Galleries Ltd., New York, Hirschfeld’s representative since 1969. We will ship your McLaughlin Group within 4 days of purchase, excluding weekends and holidays. We do not ship on weekends. All art is shipped flat. We never roll art. Edition Size: 110 numbered impressions plus artist’s proofs.